It is not often that you find an iris that can offer great garden interest thruout the growing season, but the classic species cross 'Gerald Darby' is one that really shines. This beautiful variety is a hybrid of I. versicolor and I. virginica, tho it is sometimes erroneously listed as one or the other of those species or even as the impossible cross of Siberian-Louisiana. Created by Gerald Darby, it was named and introduced after his passing in 1967 by Coe. 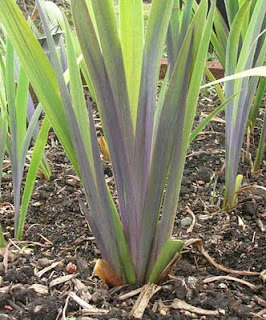 The show starts off with a bang in early spring when the fabulous foliage of this iris bursts forth heavily colored deep violet. The fans are very striking and the color rises quite high on them making it really stand out. In May the deep blackish bloom stalks emerge and rise to produce a profusion of small, flaring flowers in a lovely shade of medium blue-violet with bright yellow signals. The buds and blooms are profuse and a clump at its peak is like a cloud of butterflies. 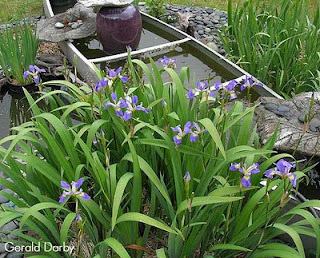 This water loving iris can reach to six feet in ideal conditions, but rarely gets taller than three and a half feet for me, as our soil is very lean. It is happiest in moist soil but does just fine in regular garden conditions, where the rhizomes appreciate a good composty mulch. After the flowers finish, the foliage color fades to green in summers heat, while the seedpods swell and float like little green balloons over the gracefully arching fans. Most species crosses are sterile but 'Gerald Darby' usually produces abundant seed here, tho I have never tried to germinate them. 'Gerald Darby' is an iris that, thru the test of time, has really proven itself to be a fantastic addition to most any garden. It is terrifically hardy and can be successfully grown from Zones 4 to 9. A vigorous grower as well, it quickly makes a beautiful clump. You can purchase it from commercial growers who specialize in beardless irises and also those that offer pond plants. Try it, you'll like it. 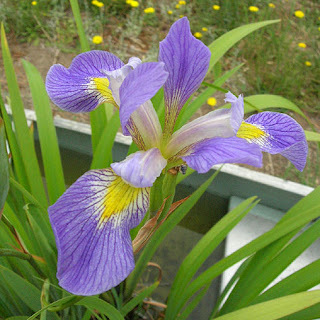 You can see loads of fabulous photos and read more about this wonderful iris and the different ways to use it in the garden at Nancy J. Ondra's garden blog. You'll find additional photos and its official registration info at the AIS Iris Encyclopedia. Thanks for the link to Nancy's blog- what stunning photographs. Tons of inspiration there! What was the I. versicolor patient? was it I. Versicolor ' Swords of Murix'? The records don't denote anything other than I. versacolor, but it can be SOM as that one was registered in 2000. GD is from the 60s.